Mandatory Photo Credit: SDSU Women's Club Water Polo. We are passing this note from the SDSU Women’s Club Water Polo team to our fan base. 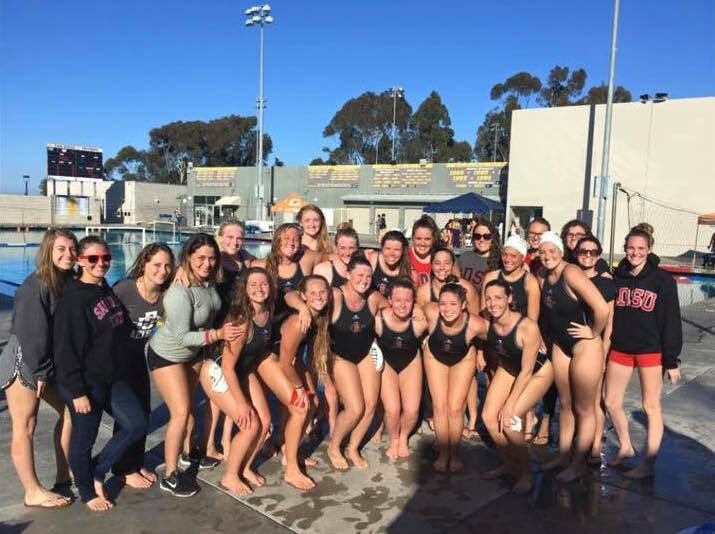 What an opening weekend of water polo for San Diego State. For starters we have an A and B team with 27 girls in the program. Some of you alumni can remember when we thought 10 was huge. For the second time ever we have two teams competing in the Southwest Division of the CWPA. So awesome to see so many Aztec fans, thanks to all the parents, siblings and alumni for making the trip. It really means so much too all us and so fun to meet you! We may need to plan a parent’s meet up during the championship tournament in April! Entire Team Mandatory Photo Credit: SDSU Women’s Club Water Polo. The opening tournament was held at UCSD last weekend. The A team played UCI, U of A, SDSU B, and UCSD. They went undefeated on the weekend posting a shut out again UCI with a score of 13-0. The B team gave the A team a run for their money in knowing where all the weakness lie. U of A is rebuilding and our team showed amazing sportsmanship in helping to teach and make water polo fun for them. The UCSD game came with the normal rivalry and they kept it close in the first quarter. Then we pulled away to win by 6 or 7 goals. The B team played UCI, UCSD, SDSU A and ASU. The team got better every game. The team really thrived in the third quarter winning all but one this weekend! The UCI game was close and the team only lost by 2 goals, if we had seen them later in the weekend it would have been a different story. The game against UCSD the team outscored them by 3 or 4 goals in the 3rd quarter. Then against ASU we had them worried at the end of the 1st quarter we were down 1 goal and only down by 2 at halftime. The third quarter showed that our conditioning is still coming as they got a few counter goals. Overall a great weekend of water polo. Plus who doesn’t love playing their teammates. Coach (Vessey) Cassidy managed to confuse the refs before the game having us all meet at half to discuss. They ref’s were like why are you guys all talking together, then oh gosh you are all San Diego State. Some of us may also have been confused as coach was literally coaching both teams, subbing from the other bench. Another example of just how much she cares and what she has done to make us a national contender every year! Other teams want to be able to see the same growth and competitiveness. Warm up for SDSU A vs SDSU B–> we are one team! Mandatory Photo Credit: SDSU Women’s Club Water Polo. The team was ready to get back to practice Monday night after a great tournament only to have all the power on the West side of campus go down, thus pizza at Woodstock’s instead! We head to U of A in two weekends (March 5 & 6) for the second Southwest tournament, this will determine the seed’s for the championship tournament. We will be hosting the championship tournament for the 3rd year in a row at the Aquaplex on April 9 and 10. So mark your calendars to be there cheering for your Aztecs. To stay up to date with our program please follow us on Facebook, Twitter and Instagram. Plus you can always email us (sdsuclubwaterpolo.womens@gmail.com) :). You can also always check out the CWPA website for information on all teams competing.